For example, a property management company located in Richmond, Virginia purchased a 50’s apartment complex situated on the Chesapeake Bay in Ocean View, a coastal region in Norfolk, Virginia. After engaging JRML for ideas on how to update the property, we visited the site and felt the building’s interior and exteriors were sorely dated and unconnected to the Bayfront site. Through historical images and publications, we learned that Ocean View was once a popular resort and streetcar hub, with an amusement park, boardwalk, and swimming beach. After collaborating, we decided that a blast of 50’s motor court cool was needed to refresh the project. 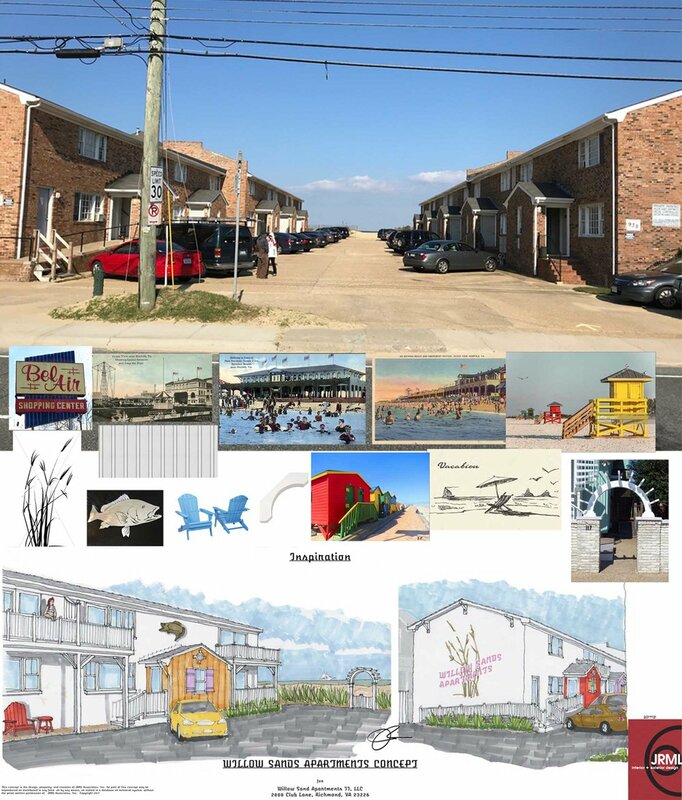 Our sketches show balconies with bay views, ironic kitsch, authentic detailing, and colorful lifeguard shack vestibules. We even reintroduced the Atomic font into our signage and branding. Now rejuvenated and reconnected to its site, only one element lacked: How do we announce the beach access? After much deliberation, the pergola became the exclamation mark, shouting: This way to the fun and sun!